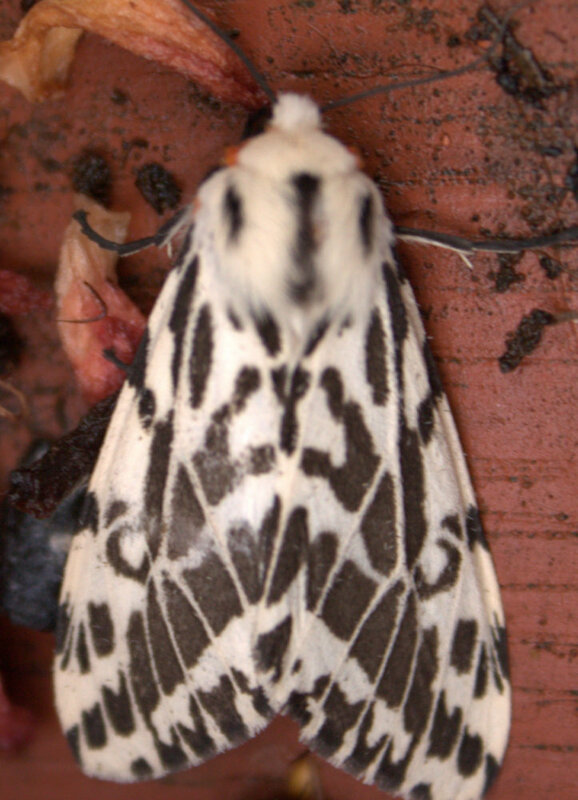 Here is a truly beautiful delicate ghost of autumn – the enchanting spectre of the Black and White Tiger Moth, Spilosoma glatignyi who I found today, resting on my worm farm. Bold amongst the reds and browns of autumn, its mothy patterns for me, reference the Snowy Owl, even down to the fluffy large head and the red-eye markings, like the Snow Owl’s piercing yellow eyes. You can just make out the intimidating ‘red eye stare’ in the photograph I took below. Moths are masters of mimicry, and having encountered a hummingbird hawk-moth back in the UK a few years ago, I remember feeling a frightened thrill as it dipped its proboscis into a lupin flower in my garden. I had no idea if I was looking at a bird or an insect. It was a truly amazing encounter and a glimpse into what it must have been like as a botanist documenting the wildlife of far off distant lands. Moths seem a bit underrated, almost unloved but they are quiet achievers. They help pollinate, impersonate other animals with their markings , and even mimic bird droppings,. Some even have calls for communication and there’s even a moth that sounds like a squeaky toy. Even if you aren’t into moths, just taking a closer look at their markings is worth it for the artistic inspiration. Previous PostEntanglement in online communitiesNext PostWill you share something that you have learned out into the #rhizowild?